My husband loves Toasted Muesli. So much so that he orders it at cafes. (Which I find a bit strange because he has it nearly every day at home.) 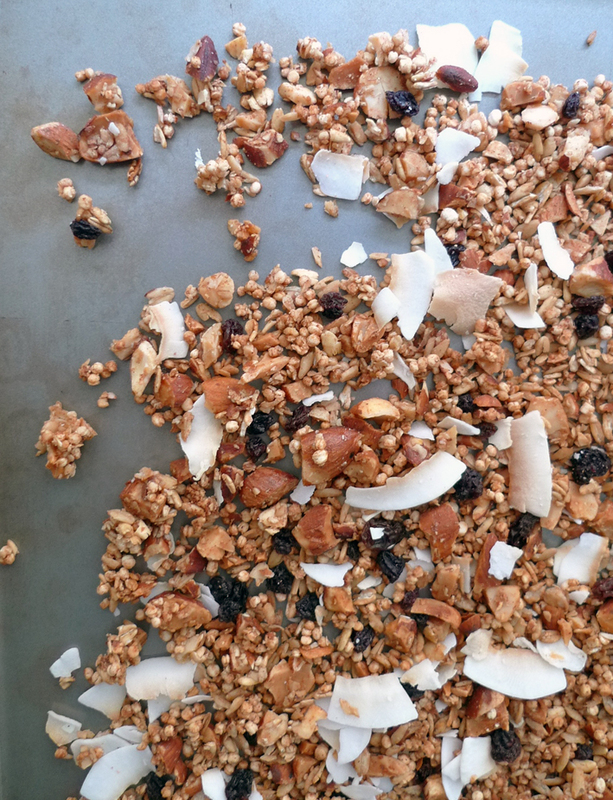 It is so easy to make, that you won’t want to waste money on pre-made / prepackaged muesli any longer. This recipe is easily adaptable to suit food sensitivities. If you want to go gluten-free, substitute the oats for quinoa or amaranth flakes. Low-Fructose, omit the raisins and currants. To make it even easier to digest, use activated nuts. Preheat oven to 150-180º C / 300-350º F.
Combine oats, quinoa, cinnamon, nutmeg and chopped almonds in a large bowl. Add maple syrup and stir to completely coat. Evenly add coconut oil to baking tray and add mixture. Bake for approx. 20 minutes or until golden brown. Remove from oven and cool. Once the mixture is cooled, stir in coconut, raisins and currants. Store in an airtight container and keep in fridge. – To make this muesli gluten-free, substitute rolled oats for quinoa or amaranth flakes. – To make this muesli fructose free, omit the dried fruit. The muesli looks so good. Thanks for sharing Kristi.